Serial entrepreneur Jay Walker has founded a number of successful start-up companies; the best known is Priceline.com, which brought a new level of value to the travel industry. Today, Priceline is a highly profitable, billion-dollar company with tens of millions of active customers. He also co-founded Synapse, a company that used the credit-card-processing network to revolutionize the magazine subscription business. Walker served as its marketing leader and created a customer database of 25 million active buyers. For his work, he won the Direct Marketer of the Year award in 1999. Synapse is now a unit of Time Warner. Walker is now chairman of Walker Digital, a privately held R&D lab founded in 1994 and based in Stamford, Conn. Walker Digital has invented hundreds of solutions for a wide variety of business problems. Since its founding, the company has funded an R&D budget well in excess of $100 million, specializing in creating innovative applications that work with large-scale networks, such as cell phones and the Internet. As an inventor, Walker is named on more than 719 issued and pending U.S. and international patents, making him one of the most prolific individual, living inventors. The company often partners with Fortune 500 firms to license its innovations or bring its inventions to market. Patent Properties, his latest venture, is a startup intending to create a voluntary, market-based alternative to the court system for the mass market of patent owners and users at disruptively low prices. By bundling related patents into discreet packages, the organization plans to create a marketplace and secure affordable licenses. Patent Properties says it creates a no-fault licensing system that will help inventors and businesses to stay clear of the courts, allowing companies to have access to desired patents they would never get without a no-fault system. Walker compares his no-fault system to the music industry, which faced many of the same intellectual-property problems 100 years ago with the advent of recorded music. At the time, individual owners of copyrighted music didn’t have the resources to monitor the marketplace and secure fair royalties for the use and performance of their protected music. Back then, big stars got paid, but most everyone else was left out. The no-fault system was inspired by the lessons from other industries that changed their procedures to stay voluntarily out of court, namely auto insurance and divorces. Walker says he made a point of learning from the insurance industry’s reliance on probability rather than certainty. Just as infringement is not clear when it comes to patents, almost nothing is clear about the future of an individual policyholder. He thinks a no-fault license can “unfreeze” 80 percent or more of the 2 million frozen patents in the U.S. 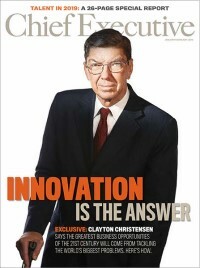 He sees the modernism in classic Clayton Christensen terms of disruptive innovation… It not only circumvents the lawyers that grow rich off the current system, it mitigates the “litigation lottery” where one can either win a jackpot or—more likely—go broke in a patent lawsuit. Then, there is the fact that trying to negotiate a patent license in good faith can get you sued, or worse. It can get your patent invalidated—leaving you far worse off. In Walker’s scheme, operating companies get licenses they need at low prices—a warranty against lawsuit costs. Also, patent owners, particularly universities, which generate about 60 percent of patents in the U.S., get revenues they never had before. After teeing up a number of clients, he plans to launch Patent Properties officially later this year. An avid collector, Walker had architect Mark Finlay design a 3,600-square-foot wing in his Ridgefield, Conn., home for “The Library of the Human Imagination,” which was constructed in 2002 to house and showcase a collection of 30,000 books and artifacts that Walker had been assembling for 20 years. Items on display at the Library include an original 1957 Russian Sputnik, the world’s first space satellite; a page from an original Gutenberg Bible; and a White House cocktail napkin, circa March, 1942—upon which President Franklin D. Roosevelt, in his own handwriting, briefly outlined his three-point strategy for winning World War II. The president jotted down his thoughts on the napkin during a Rose Garden meeting with U.S. Army Air Corps General Hap Arnold, who took the napkin back to the Pentagon where it remained classified for many years. What problem was Patent Properties created to solve? There is a large problem in American business today, specifically in global [commerce]. The vast majority of inventions that are covered by intellectual property, specifically patents, generate little or no licensing revenue because the system for which licensing is conducted is completely broken. As a result, people have been investing in innovation and in new products, services and systems; but when they get patents on those things, they’ve been unable to license the patents. You can’t license these patents [because] the only mechanism for the licensing of a patent in America is a lawsuit. There is no voluntary licensing anymore in the U.S. All of it is tied to a lawsuit. The U.S. Patent office grants you a patent; but when it comes time to turn that patent into money, there are really only a couple of ways to do this. I can sell it to you like a piece of property and you can pay me for it. That’s income. I can trade it. I’ll give you my patent; you give me yours. It’s a kind of income, or I can license it and say, “Look, why don’t you pay me a royalty of X dollars per product per year or X dollars per total per year?” You’ll use my intellectual property and you’ll license it like rental of an apartment. That system of licensing, which was a voluntary, commercial system—where one party owned an invention and licensed it to other parties who made, manufactured and distributed an invention—is completely frozen in ice. So, in American business, without a lawsuit, there is no licensing income for the vast majority of the patents. There are a little over 2.2 million active, U.S. patents and essentially, to a first-order approximation, few of them are generating any revenue. What about businesses that are based on one or more patented items? If you are the inventor and the manufacturer, then you’re generating revenue from the sale of your invention, but you’re not generating any money from the patent. You didn’t have to go get a patent to do that. It doesn’t protect anything. A patent is just the right to sue. A patent doesn’t give you any protection in America. Let’s say you spent half a million dollars inventing something; and then, you turn to your lawyers and say, “I want to you to get me a patent on this.” The lawyer says, “Okay. That’s going to cost you $20,000.” You say, “Okay. Spend that $20,000.” All you end up with from the U.S. government is a right to sue somebody else. Well, congratulations. If you have no licensing, then you undermine the entire reason for a vast majority of R&D in terms of capacity to create income. This [situation] results in forcing companies [to be] content using their own patents. But guess what happens to the American economy if you have inventions and the R&D spending is only for the companies that are using it themselves and they can never license? Half the drugs in America are licensed. They weren’t invented by the company that markets and sells them. When you buy a car or a computer, it’s filled with licensed inventions from other parties. These marketplaces used to work before the legal disaster we have today of a frozen court system and an endless set of arguments. Having a patent is really just an argument waiting to happen. Our company has been created to take the lawyers and the courts out of the system of licensing, not out of the system of creating patents, not out of the system of enforcing patents. Those things have to be done in the courts and the patent office. The patent office needs improvements. [There is] no question about that and there’s no question that our commercial, legal system is dysfunctional. Those things need fixing, but that’s not our business. Our business is unfreezing valuable assets that were frozen in the two million patents or more that are [locked] in the ice—generating no licensing revenue. There are hundreds of billions, and in some cases, more than a trillion dollars [that have] been spent in real R&D; and yet, the universities and government agencies that hold these patents and the small inventors and foreign companies that hold these patents get paid nothing. That’s crazy. How does your operation solve this deadlock? We address the licensing question by creating a new kind of license—a voluntary license that is good for both the inventor and the user. The way you do that is you take the biggest cost and uncertainty out of the system. The costs are the lawyers and the uncertainty is the courts. The concept is not unlike how no-fault has actually worked in traffic accidents and in divorces. It was clear in the divorce “industry” that having a lawsuit to dissolve a marriage enriched lawyers, but [it] didn’t enrich anybody else. We’ve come up with a product called a no-fault package license. Instead of arguing about whether or not a given patent is infringing, we will bundle a bunch of patents that are statistically relevant but without taking ownership of them. We will find patent owners who want to collect some money and are willing to allow us, on a non-exclusive basis, to license their patents as part of bundles, for which they will get some money. It may be a relatively small amount of money from each licensee, but it will be substantially more than they would have gotten [without taking this approach]. We will distribute it to the patent owners. We will not take ownership of them. We will be a non-exclusive agent. It’s a way of creating a platform for which patent owners can list their patents with us; and patent users, for a very low fee per year, can license whole blocks of patents together. We will take that money and distribute it to patent owners, minus a piece for us. those lawsuits is equal to 50 times what I’m spending here. Not only that, I also have a legal cost when other people outside might sue me and I want to demonstrate that I already license patents. So, this is a good tool to demonstrate that I do license patents—not for millions of dollars but for a small [and] reasonable amount of money. So, it gives one a good defense in court if one is sued for other things. Plus, in those 250 patents are probably ways to improve your products and services. For $1,000 a month, you suddenly, at least for the ones you’ve licensed in the package, go, “Wow! Let’s take a look at this stuff. There might be some good stuff in here that improves our competitiveness, reduces our costs or makes us more effective.” So, you’re opening up the world of opportunities of prior research that can come to help your products and services. For what? A thousand bucks a month? You can’t even call your lawyers for that amount. By pricing it disruptively low, you’re generating fair money because, in the aggregate, there’s fair money for the patent owners, who are getting nothing now. At the same time, you’re not pricing it so high that the person who is currently paying nothing now doesn’t realize, “Wait a second. I’m better off paying a little and getting real coverage than paying nothing and waiting for the inevitable lawsuit, the inevitable problems that follow.” [Paying something] reduces risk for a manufacturer or a seller. Also, it demonstrates that one is not a bad actor. What do you do when a disaffected actor claims his patent is worth more than what your bundling algorithm suggests? Here’s how that will work: Our inventors give us a non-exclusive license to try to generate revenue for them. We then go to a company and say, “Company, here’s the price we’re quoting you for the whole package.” We then go back to our inventors and say, “Here’s how much money you’re going to receive out of that total. If you want, you can drop out right now and get nothing. You can sue them yourself.” So, you’re never compelled to enter into a license [agreement] at a price you don’t want. You have an invention, a new system to monetize and create value for patent owners and patent users, so what stops somebody from ripping off your system? The short answer is maybe nothing other than the quality of our execution. I mean, you and I can form a competitor to Walmart tomorrow. Right? Walmart has very few patents that protect Walmart as a business. They simply out-execute their competitors. So, we would seek to out-execute our competitors, too. There’s a first-mover advantage in this kind of system. We learn faster. We’ll invest millions of dollars and take a risk, whether or not our computer’s algorithms are going to be good enough. But the second mover will have the easy advantage of copying us and that’s not abnormal in American business. On the other hand, if indeed we can get the elements within our system that are patentable—we know a little bit more than most people [about] how to get patents—and we would be more likely to take you to court for copying us, since we have taken more than 100 big companies to court who have copied some of my inventions. So, we’re an exception, ironically, to the rule. We can play the sport of kings because we have enough money to play the sport of kings. If you, on the other hand, invent something and somebody copies you, you’re unlikely to have the resources to play the sport of kings. That doesn’t mean they won’t compete with us. They’ll compete with us by designing solutions to the problem that we have designed a solution to that don’t infringe on our solution.